A great example of a fantastic idea poorly executed. This is a film that shows much promise on paper, but fails to deliver any sort of punch. 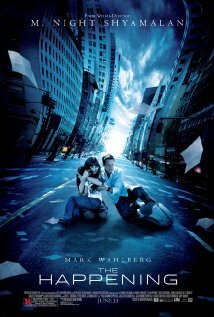 The film follows Elliot and Alma Moore (Wahlberg & Deschanel) who along with Jess (Sanchez), the daughter of close friend Julian (Leguizamo), try to escape and survive against a mysterious disease spreading across North East America. The disease, once it takes over the body, forces the individual to kill themselves. What a cool idea for a mystery thriller, right? The whole idea of taking your own life is something a lot of people don’t understand, even in the modern day. Take that, and put that in a disease which causes innocent people to jump off of buildings and cut their wrists is pretty frightening. Unfortunately, it’s only the idea that is of any particular note in this film. The script, to me, seems GOD awful. So much of the dialogue in this film is wooden and robotic, as if an amateur like me had wrote it. Also, a lot of the plot just seems basic. Alma Moore is a character that gives off the impression that there’s more to her than meets the eye – but her character is barely developed at all. She’s not the only one though – this is a film that needed to be developed far past just the theory to become anything more than the missed opportunity it is. The acting in this film is okay, but nothing spectacular. I think Wahlberg performs better as a funny-man (aka Ted), and while he is okay in suspense moments I struggle to believe him in moments of compassion especially towards Deschanel. Maybe that’s just a chemistry issue, who knows. Deschanel is the same – famous for her stint on TV series New Girl, in this her character is very distant and lost, but she struggles to sell the role convincingly. Maybe she should stick to the sweeter roles. While Leguizamo and Sanchez are critical to the story, there is not much acting done by either of them, leaving very little to judge. While Shyamalan lets us down with the script, he is definitely a good director. Some shots may have been a bit off, but the majority of it is very good, telling a story and the majority of the time keeping control of our line of sight. The only criticism I can think of is the lack of horror in the film. I understand that to fit into the 15 certificate Shyamalan had to be careful with it, but I think it would have been a much better, stronger film if it was a bit more gory and horrifying. I didn’t really know of this film, and then I stumbled upon it and was really excited by the idea and plot! Unfortunately, that’s as far as anything gets in The Happening. As far as the film goes, when the wonder of the disease wears off, that’s it. The rest is just a lot of wondering about and really not much else. Very disappointing. Worth watching the first 15/30 minutes because the disease is freaky and exciting to watch (if your into that kind of thing), but then you might as well switch it off – it doesn’t go anywhere.